FedEx (FDX), the world's leading package-delivery service and an ostensible bellwether of the U.S. economy, will dance its way onto the earnings stage this week. Also, with the holiday shopping season well underway, Best Buy (BBY) and Discover Financial Services (DFS) are scheduled to offer their most recent quarterly results. Here's a closer look at what the analysts surveyed by Thomson Reuters are expecting from these three. The Memphis-based delivery giant announced a shipping rate increase and inaugurated a new Eastern European hub during its fiscal second quarter. The consensus forecast calls for earnings to have risen 16% from a year ago to $1.31 per share. FedEx is also expected to post revenue of $9.7 billion for the three months that ended in November, a 13% increase from the same period of last year. Analysts also predict year-over-year earnings and revenue growth in the third quarter. Earnings haven't fallen short of consensus estimates in the past five quarters. The long-term EPS growth forecast is 13.3%, and the forward price-earnings (P/E) ratio is 17.7, but that's down from the trailing P/E and less than the industry average. 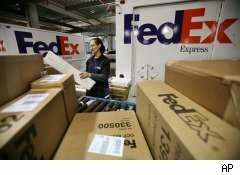 FedEx's PEG ratio is 1.3, and its dividend yield is 0.5%. The First Call recommendation has been to buy FDX for more than 90 days. JPMorgan reiterated its overweight rating despite some concern about the FedEx's third-quarter forecast. The mean price target is currently $101.75 per share, which closed Friday at $93.98, 11.7% higher than three months ago. During the three months that ended in November, Best Buy introduced a laptop for children and enticed holiday shoppers to buy early. The nation's largest consumer electronics purveyor is expected to report per-share earnings for that period of 61 cents, up from 53 cents per share a year-ago. Best Buy's third-quarter revenue is predicted to have increased 3.7% to $12.5 billion. So far, the consensus estimate for the full year calls for earnings of $3.59 per share (+12.5%) and revenue of $51.7 billion (+4.1%). Best Buy has topped earnings estimates in three of the past four quarters. Minnesota-based Best Buy has a long-term EPS growth forecast of 21.1%. Its forward P/E is 11.1, which is less than its trailing P/E, as well as the industry average. Its PEG ratio is 0.9, the dividend yield is 1.4% and the return on equity is 21.6%. Analysts on average recommend buying BBY. At least one expects a positive surprise this week. The mean price target is $46.82. At $41.80, shares are 23.3% higher than three months ago. Analysts anticipate that the credit card issuer will be one of the week's biggest earnings winner. Its fiscal fourth-quarter earnings are expected to have jumped 71.4% year-over-year to 42 cents per share. During the three months that ended in November, Discover announced an agreement with First National Bank of Omaha and First National Bank of Alaska, and it also was recognized for its customer service. But revenue for that period is predicted to come in 3.9% lower to $1.6 billion. And analysts expect to see full-year earnings of $1.01 per share (+90.1%) but on revenue of $6.7 billion (-2.4%). Discover's EPS have been better than expected in the past two quarters, beating consensus estimates by 22 cents per share in the second quarter. Discover's long-term EPS growth forecast is only 5.7%, but its forward P/E ratio of 10.6 is less than the trailing P/E, as well as the industry average. The dividend yield is 0.4% and the return on equity is 18.7%. The consensus recommendation remains to buy DFS, and the mean price target is $19.57. The Motley Fool, though, wonders if expectations are too high. Shares have been trading near the 52-week high of $19.29 for the past few weeks. Other companies expected to post strong earnings results this week include Factset Research (FDS), Nordson (NDSN), Oracle (ORCL), Research In Motion (RIMM) and Sanderson Farms (SAFM).